Taxonomy is the heart of eContext. Whether you’re using our technology to expedite machine learning projects, segment audiences by interest, or develop conversational interfaces, a curated subject matter hierarchy is what makes our semantic classification both intuitive and flexible. Of course, many of the businesses we work with come to us with their own existing topic structures—some homegrown, some open-source. If you need an easy example, just think of any shopping website and the navigation panel you’re sure to find on the left side or top of the screen. So the obvious question is: if companies already have their own taxonomies, how can they utilize ours? Some prospective customers have expressed concern that, in order to incorporate our text classification capabilities, they’d have to ignore their native structures in favor our ours. Well, not to worry: there’s no need to throw the baby out with the bathwater. One of the services available to our clients is a taxonomy overlay, which means we map our categories against yours, so subsequent classification efforts are geared towards your unique structure. We’ve been perfecting our category structure since 2008, working throughout that time to improve in both breadth and depth. 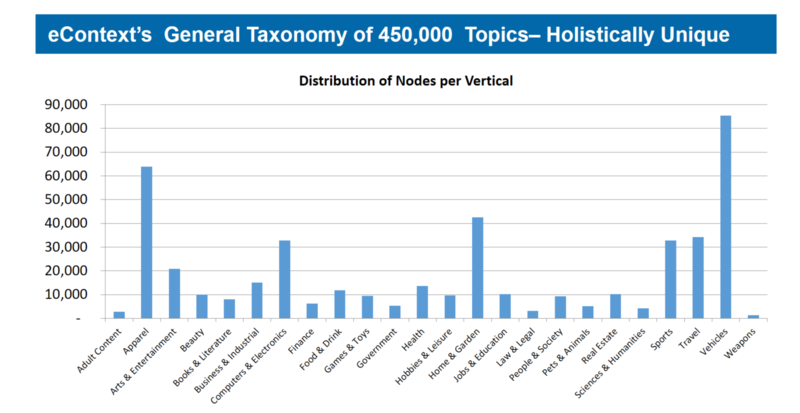 Therefore, we typically find that the eContext taxonomy is much more comprehensive than other organizations’, covering a wider variety of subjects and segmenting topics with deeper tiers of subcategories. Thus, clients receiving an overlay have the option to augment their existing structures with topics or segmentations they may be lacking. Suppose you’re a sporting goods retailer, and your organizational structure goes as deep as, say, Sporting Goods >> Winter Sporting Goods >> Skiing Equipment. eContext could map these categories against our taxonomy as described in step one, but we could also extend this branch to include several subtypes of skiing equipment, such as Ski Poles, Ski Boots, or even Ski Wax. With your structure reconciled with ours–and extended where necessary–the vocabulary rules that govern our text classification can automatically be applied without any changes required on your end. Now, any new data you classify via eContext will fit your current setup, which is great if you’re taking in more data than you’re able to sort manually. Besides streamlining your existing operations, taxonomy overlay has the added benefit of future-proofing your data, minimizing complications that arise from incorporating new software or merging with another organization. This is a pretty high-level rundown; there may be unique considerations (and advantages) in performing a taxonomy overlay for your business. We’d love to discuss with you, so feel free to contact us with any questions.